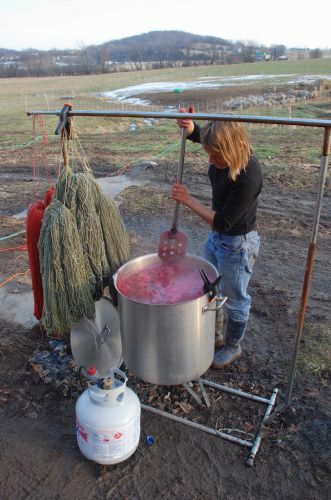 Mimicking ancient methods of purple dyeing with carmine and indigo. On the low hills south of Goshen, New York, a farm with a little flock of sheep hand dyes its own yarn. There is something beautifully real about seeing a snowflake dissolve in a steaming pot of wine red cochineal. 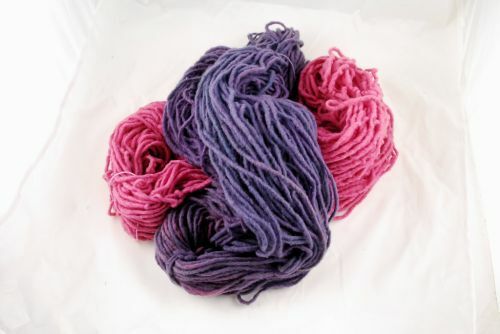 They begin with a medium-dark cochineal and over dye it with an indigo to produce a violet, a secondary color. The word “purple” comes from the Old English word “purpul,” which is from the Latin “purpura” and from the ancient Greek “porphyra.” This was the name of the Tyrian purple dye manufactured in classical antiquity. In human color psychology, purple is associated with royalty and nobility because Tyrian purple was only affordable to the elite. Byzantine empresses gave birth in the Purple Chamber. Therefore, Porphyrogenitus ("born to the purple") was the name of an emperor which gained his throne by dinasty and not by force. Some confusion exists concerning the color names "purple" and "violet.” Purple is typically defined as a mixture of red and blue light, whereas violet is a specific spectral color (approximately 380-420 nm). Purples can be formed by mixing red and blue pigments, but the first truly violet pigment was cobalt violet, prepared in 1859. The first synthetic dye was discovered by a teenager in 1856, who accidentally made a purple dye that would soon become the height of fashion in Victorian England. William Henry Perkin originally set out to discover a synthetic alternative to quinine. As he cleaned up his experiments with aniline, he noticed a thick black residue at the bottom of a flask. After further experimentation with diluting the sludge, Perkin realized that the mixture could be used to dye silk and that the dye would retain its color. Until that point, purple dyes always faded fairly quickly. Perkin initially called his new dye "Tyrian Purple," but it was later known as "mauve." Mauve quickly became all the rage in English high fashion.